Press Trust of India, New Delhi/Trade ministers of 16-member RCEP bloc, including India and China, have urged all participating countries to continue to exert all efforts for early conclusion of the negotiations, the commerce ministry said on Sunday. The progress of the talks for the mega trade deal RCEP (Regional Comprehensive Economic Partnership) was discussed during the two day meet of ministers in Singapore, concluded Saturday. "While appreciating some narrowing of gaps, the Ministers urged all RECP Participating Countries to continue to exert all efforts towards meeting the targets set in the package of year end deliverables," the ministry said in a statement. Minister of State for Commerce and Industry C R Chaudhary attended the 6th RCEP Inter-sessional Ministerial Meeting (IMM) in Singapore on 12-13 October. Chaudhary also held bilateral meeting with Trade Minister of Singapore. The island nation sought India’s help in early conclusion of RCEP negotiations, it said. Next round of meeting at chief negotiators level is scheduled to be held in Auckland later this month. Earlier a joint statement issued after the meeting of trade ministers in August has stated that the countries adopted a package of year-end deliverables developed by the trade negotiating committee. The ministers had expressed hope that completion of the package would signify the substantial conclusion of the RCEP negotiations this year. However, Commerce Minister Suresh Prabhu had earlier stated that the talks would continue for next year. RCEP aims to cover goods, services, investments, economic and technical cooperation, competition and intellectual property rights. 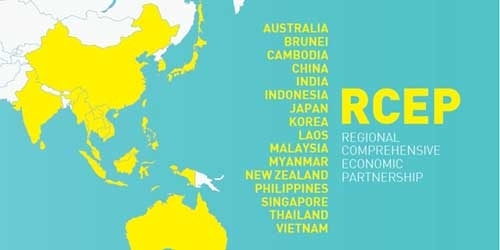 The RCEP is a proposed free trade agreement being negotiated by 16 countries, including 10 Asean members (Brunei, Cambodia, Indonesia, Malaysia, Myanmar, Singapore, Thailand, the Philippines, Laos and Vietnam) and their six free trade agreement partners - India, China, Japan, South Korea, Australia and New Zealand, since November 2012. The mega pact aims to relax norms and significantly cut import duties to boost trade in goods, services, promote investments, technical cooperation, and intellectual property rights.